Each vote costs $2.00 and it is up to the candidate to campaign and raise the funds personally or through friends and family. All proceeds go to the FINN Fund - Friends In Need Now. Barney, long time resident of Sointula, a true pillar of the community, was voted 2012 Salmon King. He will reign until challenged. 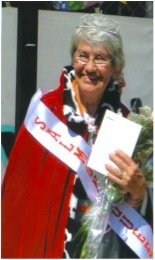 Tuula, much loved matriarch of Sointula, was voted Salmon Queen 2011. She will also reign until challenged.